Take the next step. John Jay College’s graduate programs open a new world of possibilities for you and your future. Our outstanding graduate programs deepen your knowledge and sharpen your skills in a range of exciting and rewarding fields with career growth, from criminal justice and public service to mental health and private security. If you want to advance your career or start a new one, satisfy your intellectual curiosity or gain a competitive advantage on the job market, John Jay’s masters and doctoral programs open doors to your future. Because our programs focus on real-world problems, they prepare students to become successful leaders, entrepreneurs and innovators—individuals who will contribute to building their organizations and a just world. At John Jay you will learn from nationally and internationally known experts and award-winning professors who are highly respected for their scholarship and life-long achievements in the field. 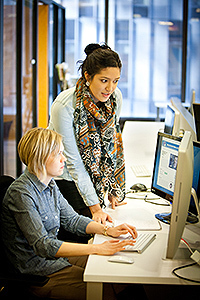 Our faculty use cutting-edge teaching and research methods that bring learning to life. Committed to the success of our graduate students, our faculty engage and mentor our students to ensure that they learn and develop their potential. From the moment students embark on their graduate careers with us, our faculty partners with them to guide their professional trajectories. With rich analytical and cross-disciplinary skills, our graduate students are well prepared with the tools they need to succeed. Join us and take the next step. Are you interested in learning more about John Jay College of Criminal Justice? By completing the Graduate Inquiry Form, you will receive information from the Office of Admissions, including information about programs, on-campus events, information sessions, important reminders and more! *Do Not fill out this form if you have already applied to John Jay!